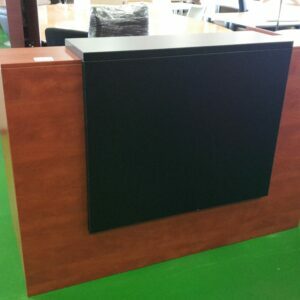 At Has Been Office Furniture we sell quality second hand reception desks, counters, and couches at an affordable cost. Reception desks protect your receptionist as they provide a level of privacy and transform your reception area into an inviting professional environment where you can welcome your clients. Buying reception counters and office furniture need not be an astronomical expense- used office furniture gives your business an established feel, while at the same time doing wonders for the environment as well as one’s back pocket. We also sell a number of reception couches, which fly out of the showroom at an exceptional rate. 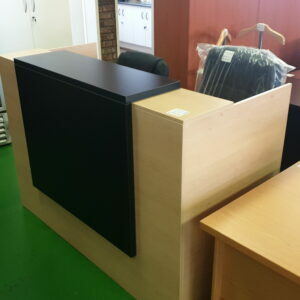 Come visit our Randburg showroom to view the extensive range of reception counters we have on offer to see what makes us the leading supplier of quality used office furniture in Gauteng. 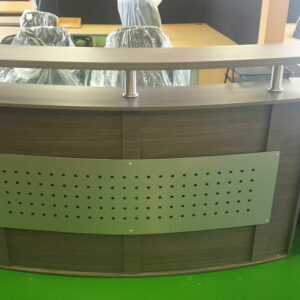 You can also get a quote for our wide range of brand new reception furniture, or find a bargain on sale online. Measuring the space available for your reception unit is an excellent first step and makes the decision-making process much easier. Bear in mind that the minimum area reception personnel need is between 750mm and 950mm from the edge of the desk depending on the size of the person. Contact us with your requirements and we will send you pictures of what we have available. We also stock a huge variety of other office furniture suitable for any office needs large or small, including filing cabinets, office desks, boardroom tables, office chairs, and more. Contact us for all your office furniture needs and get great service, prices and delivery.